The district was provided with a $30,000 scholarship from the Lenape Regional Foundation. 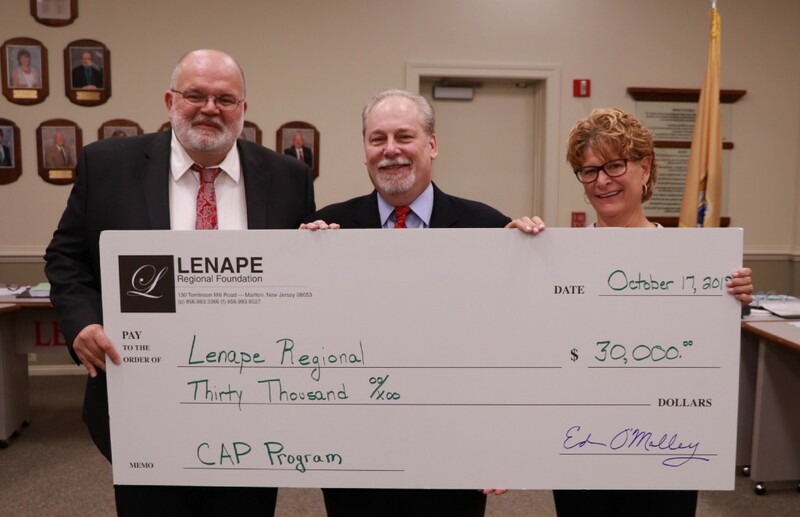 The Lenape Regional Foundation presented a check for $30,000 to fund the College Acceleration Program Scholarship at this week’s Lenape Regional High School District Board of Education meeting on Oct. 17. From left are LRHSD BOE Vice President Barry Fitzgerald, Lenape Regional Foundation Chair Ed O’Malley and LRHSD BOE President Margaret Estlow. At this week’s Lenape Regional High School District School Board of Education meeting, there were two presentations regarding the College Acceleration Program and safety reports. The CAP Scholarship from the Lenape Regional Foundation provides district students the opportunity to earn college credits while still in high school. Superintendent Carol Birnbohm explained CAP is a partnership between LRHSD, Rowan College of Burlington County, and Rowan University, where students can earn college credit for high school courses that have been approved by the college as being college eligible. She stated that last year more than 1,300 students earned more than 10,000 college credits in one school year. President of the Lenape Regional Foundation, Ed O’Malley, presented a check to the foundation for $30,000 to grant more students access to the program. A second presentation at the meeting was given by District Security and Emergency Management Coordinator Jim Kehoe regarding the 2017–2018 school year safety reports. For the entire school year last year, there was a decrease in incidents reported involving weapons, with only one weapon report for a student with possession of an expandable baton. The district reported 107 non-duplicated violence, vandalism and substance abuse incidents compared to 77 non-duplicated incidents during the 2016–2017 school year. This reflects in a 30 incident increase, with the total of 107 incidents standing for about 6,840 students. The harassment, intimidation and bullying reports remained the same compared to last year, with one confirmed race incident, two confirmed gender incidents and two confirmed sexual orientation incidents. The consequences for these situations include suspension, counseling for both parties involved, schedule modifications, cease and desist agreements, supplemental instruction and removal from school. There were 19 HIB student programs throughout the district last school year, including peer leadership training at Seneca High School, Green DOT program at Shawnee High School, No Place for Hate, Award Winning Step Up and ID HIB program, Upstander program, Violence Awareness Week, Week of Respect, leadership and role model programs and peer mentor programs. There were also 46 HIB-related training events for staff and students throughout the 2017–2018 school year, including HIB policy, procedures and anti-bullying bill of rights. There were 1,037 students throughout the district who registered to vote. There are 225 students who are eligible to vote in November, the remaining will get their voter registration cards in the mail throughout the year when they turn 18. The next LRHSD board meeting will be held on Nov. 14 at 7:30 p.m. at the Lenape District Administration Building.